Canadian-focused lithium and precious metals explorer Ardiden Limited ("ADV" or "the Company") (ASX:ADV), is pleased to advise that discussions with the Mishkeegogamang First Nation with regard to drilling operations at the Kasagaminnis Gold Prospect near Pickle Lake Ontario, Canada are proceeding positively. Ardiden's initial goal is to complete sufficient drilling at the Kasagaminnis Gold Prospect to satisfy final expenditure requirement and attain 100% ownership of the Pickle Lake Gold Project. Additional drilling is intended, with the goal of defining a large Mineral Resource at the Kasagaminnis prospect, over the medium term. Ongoing cooperation with the Mishkeegogamang First Nation people is viewed by Ardiden as fundamental to successful longer-term development. Ardiden acknowledges the ongoing use of the land by the Mishkeegogamang people and the importance of completing exploration in a manner that respects current uses, sacred sites and traditional beliefs. As part of its commitment to protect the environment, Ardiden has commenced a continuous water-quality monitoring program which the Mishkeegogamang will participate in. Discussions of longer-term goals between the Mishkeegogamang people and Ardiden commenced with a community meeting at the Mishkeegogamang Community Centre on 5 April 2019 and included Chief David Masakeyash, Councillors and Elders of the Mishkeegogamang First Nations with key Ardiden personnel (see Figure 1 in link below). Underpinned by early-stage exploration success from the 2018 due-diligence drill program at the Kasagaminnis Gold Prospect, the Board believes the Pickle Lake Gold Project offers a significant opportunity to provide near-term shareholder value and to leverage strong investor appetite for gold. The refined strategic approach comes after Ardiden delivered on its principal strategic objective of a significant Mineral Resource upgrade at the Seymour Lake Lithium Project (ADV: ASX Announcement 6 March 2019). Ardiden Chairman, Mr Neil Hackett commented, "Seymour Lake is a valuable asset with a solid resource, quality characteristics and considerable exploration upside." "Notwithstanding, the Board has watched the lithium and spodumene market dynamics closely in the past 12 months and has determined that the most prudent approach at present is to limit further expenditure on the lithium assets and pursue strategic partnership opportunities." "Forecasters are in widespread agreement that the lithium and spodumene market may remain in oversupply in the immediate future, putting downward pressure on pricing. Ardiden is a strong believer in the ongoing global lithium battery revolution and is confident that high-quality spodumene concentrate, such as that produced in metallurgical testing from Seymour Lake, will be highly sought after. However, it is not a sensible approach for Ardiden to continue aggressively progressing Seymour Lake considering the current economic landscape. Rather we will investigate strategic partnership options to best exploit the Seymour Lake Project's full potential." "We believe a more prudent use of shareholder funds at this time is exploration expenditure at the Pickle Lake Gold Project, which we view as an exceptional, near-term opportunity in a commodity that is non-cyclical, backed by exciting historical data in a world-class mining jurisdiction." The Company is developing a detailed drilling plan for the Kasagaminnis Gold Prospect, focussed initially upon securing 100% ownership of the project, then progressing towards definition of a maiden Mineral Resource. 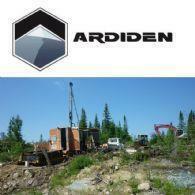 Ardiden Limited ( ASX:ADV ) is an emerging international diversified exploration and development company possessing a mature multi-element asset portfolio, with a near term development pipeline, focused quality projects located in the established mining jurisdiction of Ontario, Canada.